One of many unlockable scenes in 2013 Wii U game Game & Wario, one of Nintendo’s strangest releases ever. 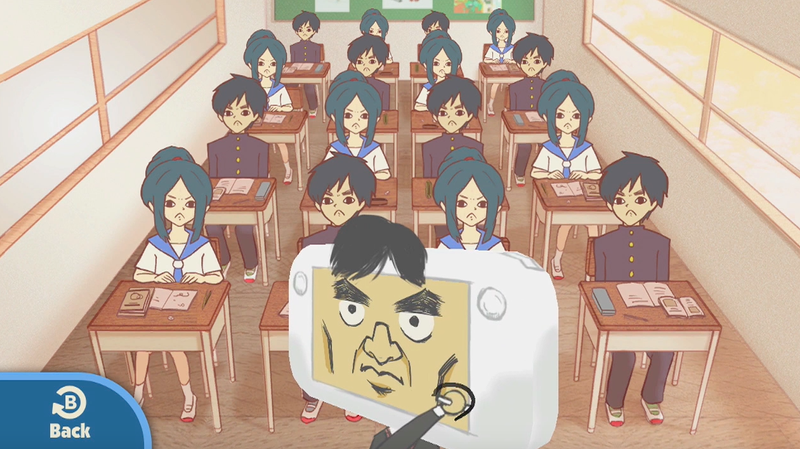 Turning the Wii U GamePad in real life would swivel the teacher’s head. When he faced the blackboard, the kids would act up. They’d quiet when he turned around. The Nintendo games that star an acrobatic plumber, a go-kart-racing dinosaur or a bounty hunter are what passes for normal from the world’s most successful video game company. Thank goodness Nintendo regularly gets far weirder than that. I certainly enjoy playing new Zelda games and get excited for new Fire Emblems, but the recent announcement of Nintendo Labo—a system for slotting the Switch into folded pieces of cardboard to build a fishing rod, a car and other toy contraptions—reminded me that my favorite thing about Nintendo is that the people there regularly make weird, odd stuff. Or at least they used to, as I’d begun to worry as 2017 wound down. As good a year as 2017 was for the Nintendo Switch, it was a relatively conservative year for Nintendo’s software, with a focus on new releases in major franchises. Those new games were largely excellent, but they weren’t any indication, beyond the odd hardware that they ran on, that Nintendo was still invested in being weird. On previous consoles and handheld systems, Nintendo had embraced peculiarity, and Labo is the first big sign that they’ll still do so with their software for Switch. If they hadn’t, it would have been a shame, because Weird Nintendo is, I’ve realized, my favorite Nintendo. In its first year, the Nintendo Switch had some hints at oddness. Launch mini-game collection 1 2 Switch was uncharastically filled with live-action video. Nintendo did publish the strange download-only multiplayer game Flip Wars in the middle of the year. Mostly, though, Nintendo avoided putting out quirky software, focusing on the conventional. I will always want more of Weird Nintendo. I explain it in today’s episode of TL;DR with Alex Bedder (embedded in this post). I crave Nintendo’s oddest games. Take the Nintendo that created 2014’s Rusty’s Real Deal Baseball, a great game that lets players haggle with a depressed virtual dog to lower the real-money prices of the mini-games that players can buy from him and play. Take the Nintendo that published the old Game Boy Advance “Bit Generations” games and their spiritual successors, the Art Style games, my favorite of which is called Boxlife and involves folding boxes in a factory. Trust me, it’s excellent (and still downloadable to the 3DS). Take the Nintendo that created the world’s best-selling sports game by realizing it would be more fun for more people to play tennis or bowl in a video game just by swinging their arm. I don’t love all the experiments. I’d rather play Metroid Prime or a new Mario & Luigi than Wii Sports and Nintendogs, but I consider it vital that the latter comes from Nintendo or at least from the studios Nintendo works with. With each Nintendo Direct, I’ve found myself waiting for the announcement of the Switch’s equivalent of the HAL-made, black-and-white Box Boy platformers or of the Game-Freak-developed mash-up of horse racing and poker that was Pocket Card Jockey. Such games were weird deviations from the studios behind the Kirby and Pokemon games and both, published by Nintendo, made the 3DS a more interesting system. Weird Nintendo gets us a whole new genre of fishing and ghost-hunting and cooking games that are driven by the technical capability of two 3DS players passively exchanging game data as they walk past each other. Weird Nintendo gets us things like the ludicrous Game & Wario on Wii U that includes a mini-game about hiding a character’s game-playing habits from his mother and a special mode that lets you peer into a gnome’s house—among many other very strange things. In most adventure games the rewards for your heroic deeds are pre-determined. Save the princess or beat the mini-boss, and you can trust that you’ll be rewarded with an amount of gems, hearts or some other reward appropriate for your survival through the next stage of the game. In “Tingle,” the people you save ask you what your reward should be. In the game, I saved a dehydrated journalist by serving him some needed drink. He asked me to name the figure for my reward. I did not jot down in my notes the amount I asked for, but I did note that he laughed that I asked for so little. He gave me what I wanted, but it seems I could have taken him in for more. Had I just cost myself some money that I would need to buy my way through the next level? In most adventure games you are given a map — or you can buy one. In “Tingle” you can risk navigating in ignorance by selling your maps back to the game. At the start of each chapter of “Tingle,” you are given an unfinished map. You can complete each one by circling areas where you find unusual land formations and monuments. While exploring the game’s Lon Lon Meadow area (“Zelda” reference, see? ), I was hurting for money. So I went to the old lady in town, sold my map of Lon Lon for 1250 rupees, thereby deactivating the map read-out on my DS’ upper screen. What’s next, selling your health bar or inventory screen for profit? What would you do without in your heads-up display to gain more money and health for your character? The Tingle game is wonderfully weird and such a great example of how odd Nintendo is willing to be. Weird Nintendo isn’t the only Nintendo I want, but Labo has helped me realize how much I missed it. I hope Nintendo’s cardboard creations aren’t the end of the streak. I hope the maker of Mario remains weird for a long, long time.